FC Twenty 11 School Programmes are designed to work with kids of all ages, developing basic balls skills and a love of the game. As a Mainland Football affiliated club, we follow the New Zealand Football philosophy and practices to engage and develop the children. Each session will be managed by our Football Development Manager, Ollie Hawkins, and supported by FC Twenty 11 First Team coaches and/or players. Football literacy programme. A 4-6 week programme commencing with basic ball skills concluding with a ‘football festival’ in the final week. Each programme will run for 45 minutes per session. Football festivals. A one-off 45 minutes session with small sided football games. 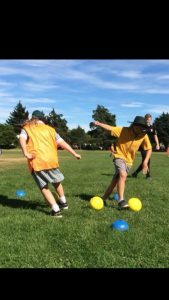 FC Twenty 11 School Programmes are proudly funded by Kiwi Sports and Sport Canterbury, with alignment with Mainland Football. If you would like our qualified and experienced coaches to visit your school, then please don’t hesitate to contact our Football Development Manager, Ollie Hawkins, on ollie@fctwenty11.co.nz.